Does your business have excess inventory or outdated equipment and supplies? Your company can donate them to classrooms that desperately need supplies and be eligible for a tax deduction of up to 200 percent. When it comes to creative teaching aids, teachers have come to depend on the Ocean Bank Center for Educational Materials to provide them with not only that unique tool to motivate their students, but also the everyday staples they need. Sponsored by Ocean Bank, the Ocean Bank Center for Educational Materials is a 11,000 square foot warehouse and distribution program that accepts donations of usable excess basic school supplies and educational materials, inventory, remnants, leftovers, surplus supplies, and more from companies, which it then makes available free of charge to Miami-Dade County Public Schools' teachers for their classrooms. Miami-Dade County students benefit by having the materials necessary for their lessons and businesses benefit through an up to 200-percent tax deduction on the goods. 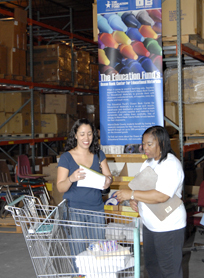 Teachers may shop for free twice each year, or on more occasions if they volunteer their time at the warehouse. As a source of free materials for public school classrooms, the Ocean Bank Center has raisedd over $8.2 million in classroom supplies and has logged 26,025 educator visits since opening in 1993, reaching close to 2 million M-DCPS students.